A few days ago the ODA released a Qt based free cross platform DWG and DGN viewer built on the Teigha platform running on Windows, Linux and Mac. One of the purposes for doing so was to give developers an application to test their Teigha extensions (or plug-ins) for applications built on the Teigha platform. Today the ODA released the free Teigha Xtension SDK that allows programmers to do just that. The Teigha Xtension SDK is a subset of the full blown Teigha SDK and can be used to write plug-ins for applications built on the Teigha platform. However, in order to build the applications themselves you need to the full blown Teigha SDK. And for that you need to join the ODA. Writing a Teigha extension is really very easy. In one of the chapters of my book “OpenCAD – A Step by Step Guide to Developing a Professional CAD Application” I explained how to write a plug-in using just 22 lines of C++ code. That was when Teigha was called DWGdirect and the version was 2.06. I wanted to check if the situation remained the same in Teigha 3.4. 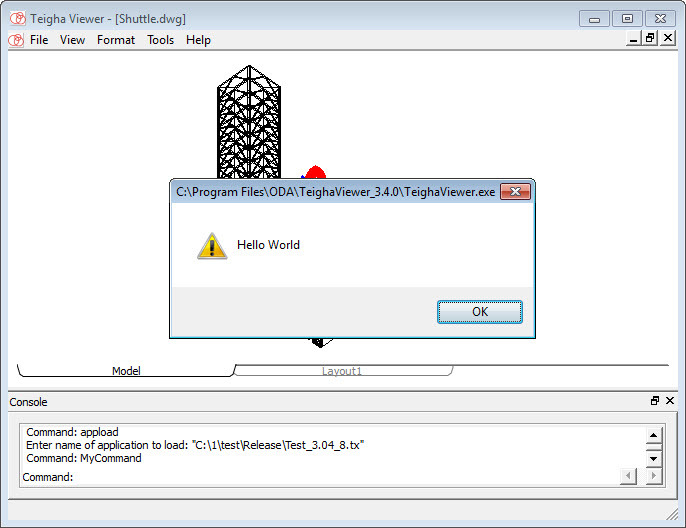 So I downloaded the Teigha viewer and quickly created a plug-in for it using the Teigha SDK. Yup! Its still that easy.